While the upcoming Anthem game may look like an entirely new type of experience from BioWare, it does share something in common with the titles that have come before it baring the studio’s name. Much like Star Wars: Knights of the Old Republic, Jade Empire, Mass Effect and Dragon Age, there is a single-player, character-centric story at the heart of the action. It’s there in Anthem, it’s just isn’t being presented in a way that you might be expecting. The On The Radar: Anthem hub is where you will find all of our in-depth and exclusive coverage of BioWare's latest RPG experience. The unique setup, should you need reminding, is BioWare’s take on a live-service shooter. The studio has created a large open world designed to facilitate seamless cooperative play between Freelancers – groups of mercenaries that jump into heavily customisable exoskeleton suits – as they face down a mysterious alien threat emerging from a tainted void of creation. And it wants to enable this shared action experience without sacrificing the deep and reactive storytelling that the studio is so famous for developing. 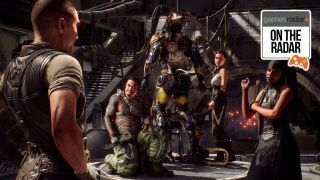 The unique part of the equation comes from Anthem’s schism between single player and multiplayer narrative design. Okay, so let’s break this down. This is how BioWare is looking to channel what is effectively a single-player narrative inside of a predominantly multiplayer-focused experience. As you head out into the world to participate in missions, you are heading out into those missions together with other players; The events and scenarios that generate while you’re in the middle of the action, as you team up with friends and strangers to take on threats, will will create unscripted, shareable stories. These missions will, however, ultimately culminate in Fort Tarsis – one of the last protected homes for humanity – which is a fully instanced hub area populated by an array of classic BioWare characters, quest givers and NPCs that you’ll be able to converse with, interact with and stan on Twitter when you think that nobody’s watching. When you return to Fort Tarsis – a place for you and you alone – you will see and feel the consequences and choices that occur on these missions reflected back at you. The idea is that Anthem is straddling the line between two types of storytelling experiences. On missions you’ll be engaging in communal storytelling, engaging in the types of multiplayer narratives that tend to dominate Twitch streams and Sub-Reddits. Once you return to Fort Tarsis, on the other hand, you’ll be able to really dig into the type of lore dives, exposition and character interactions that may usually warrant a spoiler warning in a traditional BioWare game. Rootsaert is quick to acknowledge that “the most radical changes that we had to make in order to adapt to the multiplayer and single-player split have been technical”, and she doesn’t believe that this has affected BioWare’s ability to tell an engaging story with good characters, lots of heart, and plenty of spectacular moments all weaved in with one another. Fort Tarsis is a space that will continue to shift and evolve as you move throughout the story of Anthem. As you complete missions, complete quests for the your Faction of choice, and otherwise engage with the crew of NPCs stationed in the spacious area, your progress through the narrative will be reflected in both the dialogue and visual design – not unlike how the Citadel, Normandy and Skyhold would work to reflect current events and tensions in Mass Effect and Dragon Age. Anthem lore, characters and factions explained: Lead BioWare writers Cathleen Rootsaert and Jay Watamaniuk sit down to discuss all things story related. BioWare has been keen to note that no game-centric content will be cut off entirely through these choices, you might just have to work a little harder to discover certain bits of lore or cosmetic skins should you decide to push your relationship with one character or Faction to a breaking point. Still, this isn’t the biggest challenge that the team has had to consider when attempting such a bold narrative framework: “The challenge is the chaos of not knowing where in the story a player might be compared to another player,” Rootsaert tells us. That makes sense. Players will be moving at different speeds through Anthem when it launches on the 22 February. The game is designed to deliver matchmaking for all of its core missions and give you the ability to meet up with your friends in the Launch Bay or out in Freeplay at any time, regardless of where you are in the story. We’re still waiting to see exactly how BioWare has handled every aspect to these particular problems – some are larger creative challenges than overs. For example, in an effort to keep the matchmaking servers busy, BioWare has confirmed that you will be able to replay missions that you’ve already completed at any time (be it with friends or in a matchmade group) and you can expect to be rewarded for doing so. That’s a small hurdle in the grand scheme of things. A bigger one is how your personal choices will reverberate out of Tarsis and into the actual missions themselves; the studio has only teased scenarios thus far. One clear example is that NPC dialogue (even while you’re in the midst of a mission) will be delivered to each individual player and can indeed reflect decisions you’ve made in your own specific Fort Tarsis – so if you’re really pissed off a mission-critical quest giver you might just find that they are a little curt as they are barking objective orders in your ear, while your friends are none the wiser. That might not sound like much, but the technical hurdles associated with such a feat are massive. BioWare has encountered problems like this all throughout Anthem’s design and it has met every one of them head on. Perhaps that’s why we are so excited to see how this format will expand and evolve over time. The live service nature and dual-storytelling structure of Anthem means BioWare has more space to play than ever before. Edge magazine uncovers how Anthem almost became a free-to-play experience before BioWare settled for a different model.